At times, it seems, when the architectural heritage of Dublin is being promoted or advertised, there are only two options: either the great imposing buildings of Church, State and Society, such as the Parliament House (Bank of Ireland), Trinity College Dublin, the GPO, Dublin Castle, Leinster House and the cathedrals; of the great Georgian squares and terraces, such as Merrion Square, Fitzwilliam Square, Fitzwilliam Place, Fitzwilliam Street, and Pembroke Street. The architectural historian Maurice Craig once listed the five major elevations of Dublin as: the Royal Hospital, Kilmainham; the Parliament House; Trinity College; the Custom House; and the Four Courts. In advance of the Saint Patrick’s Day parade in New York in 1970, a colourful collage of Dublin doors appeared in the window of the Irish Tourism offices on Fifth Avenue. People on their way to watch the parade were so mesmerised by the collection that the offices were inundated with requests copies. There were so many requests that Joe Malone, then North American Manager of Bord Fáilte, commissioned the poster that has since become an icon of Ireland and Irish architectural heritage. The doors are on houses on the Georgian squares and streets of Dublin that were laid out during the Hanoverian period in the 18th century as Dublin attracted new wealth. But the focus on Dublin’s Georgian heritage means we often neglect the equally attractive and beautiful heritage of domestic architecture, including the houses and terraced villas built in the narrow but elegant streets on the south side of the city as Dublin found renewed prosperity in the Victorian age. On my way to speak at a protest in the city centre yesterday afternoon [27 August 2015], I stopped off at the south or Kelly’s Corner end of Camden Street, and strolled through the area on the west side of the street, which is an almost complete Victorian suburb in itself. The development of these streets probably began in the late 1830s. They include Pleasants Street, Heytesbury Street, Grantham Street and Synge Street, which were laid out and built over the space of three decades between the late 1830s and the late 1860s. The name of Pleasants Street honours Thomas Pleasants (1729-1818), a Carlow-born merchant, property developer and philanthropist in Dublin. His bequests included over £12,000 for the erection of a large stove-house near Cork Street for poor weavers in the Liberties, £8,000 towards building the Meath Hospital, and his own house at 67 Camden Street to provide a girls’ school and orphanage, along with £1,200 a year to run it and extra sums for dowries for the girls. Heytesbury Street was named after Lord Heytesbury, who was the Lord Lieutenant of Ireland from 1844 to 1846. But I wondered how Grantham Street could have been named after the Earl of Grantham, the aristocrat at the centre of the storyline in Downton Abbey, still less that it could have been named after Margaret Thatcher’s home town. It turns out, though, that the title of Baron Grantham was one of the minor titles held by Heytesbury’s predecessor, Thomas de Grey (1781-1859), 2nd Earl Grey and 3rd Baron Grantham, who was the Lord Lieutenant of Ireland from 1841 to 1844. He was known as Lord Grantham from 1786 until 1833, and perhaps his interest in Ireland was sparked many years earlier, for his wife Lady Henrietta Cole, was a daughter of the Earl of Enniskillen. During his time in Ireland he disagreed with Sir Robert Peel’s religious conciliation of Ireland, claiming that economic conciliation was a greater priority. He called for more legislation focused on Ireland while Peel pursued economic legislation aimed at benefitting the UK as a whole. But, apart from an open declaration of loyalty, there may have been other reasons for an aspiring and ambitious architect to name Grantham Street after Lord de Grey: when the Institute of British Architects was founded in London in 1834, he became its first president. The institute received a Royal Charter in 1837 and became the Royal Institute of British Architects. He remained its president until he died in 1859. The buildings on the south side of Grantham Street, between Synge Street and Heytesbury Street, are larger than those on the opposite, north side, but some of these houses are now in a sad state of neglect and dereliction, and it seems some of their finest Victorian features are being purloined. On the east end of the street, the Camden Market was built in 1907. This is a row of red-brick shops with brick pilasters and a balustrade parapet. A few steps away is the former Saint Kevin’s Female National Schools built in 1886 and designed by George Coppinger Ashlin (1837-1921), a son-in-law of AWN Pugin and a partner of first Edward Welby Pugin (Pugin and Ashlin) and later of Thomas Aloysius Coleman (Ashlin and Coleman), two partnerships for which my grandfather and great-grandfather worked, and of William Henry Byrne (Ashlin and Byrne). The third building noted in most architectural guides is the three-storey, three-bay, brown-brick Widows’ Almshouse at No 3 Grantham Street, designed by John Louch and built in 1858. But there is an attractive and often unnoticed terrace of 11 houses on the north side of Grantham Street, between Heytesbury Street and Synge Street, and walking along them, attending to each one by turn, one-by-one, from No 3 to No 13, it is possible to have a masterclass in architecture in a few quick minutes, learning about the orders of classical architecture from the pillars and porches of each house. The Architectural Orders or ancient styles of classical architecture are distinguished by their proportions and characteristic profiles and details, and most readily recognisable by the type of column employed. Three ancient orders of architecture that originated in Greece are the Doric, Ionic, and Corinthian orders. To these, the Romans added the Tuscan, which they made simpler than Doric, and the Composite, which was more ornamental than the Corinthian. It has been said that the architectural order of a classical building can be compared to the mode or key of classical music, or the grammar or rhetoric of a written composition. It is established by certain modules like the intervals of music, and it raises certain expectations. Each style has distinctive capitals and entablatures. The column shaft is sometimes articulated with vertical hollow grooves known as fluting. The shaft is wider at the bottom than at the top, because its entasis, beginning a third of the way up, imperceptibly makes the column slightly more slender at the top, although some Doric columns are visibly “flared,” with straight profiles that narrow going up the shaft. The capital rests on the shaft. It has a load-bearing function that concentrates the weight of the entablature on the supportive column, but it primarily serves an aesthetic purpose. The necking is the continuation of the shaft, but is visually separated by one or many grooves. The echinus lies atop the necking. It is a circular block that bulges outwards towards the top to support the abacus, which is a square or shaped block that in turn supports the entablature. The entablature consists of three horizontal layers, all visually separated from each other using mouldings or bands. 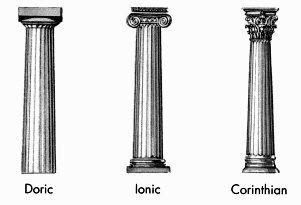 The three distinct orders in Ancient Greek architecture, Doric, Ionic and Corinthian, were adopted by the Romans, who modified their capitals from the 1st century BC. The three Ancient Greek orders have since been consistently used in neo-classical European architecture, and the terrace of houses on this side of Grantham Street, from No 3 to No 13, almost provides a textbook illustration of their use. Sometimes the Doric order is considered the earliest order, but there is no evidence to support this. Rather, the Doric and Ionic orders seem to have appeared at around the same time, the Ionic in eastern Greece and the Doric in the west and mainland Greece. Both the Doric and the Ionic order appear to have originated in wood. 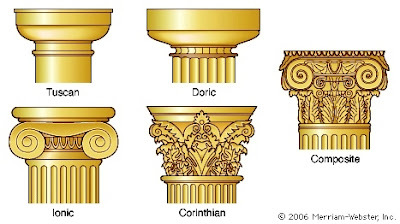 The Doric order is the simplest of the orders, characterised by short, faceted, heavy columns with plain, round capitals or tops. The Greek forms of the Doric order come without an individual base. Later forms, however, came with the conventional base consisting of a plinth and a torus. The Temple of Hera in Olympia, built ca 600 BC, may be the oldest well-preserved temple of Doric architecture. But perhaps the most famous example of a Doric building is the Parthenon in Athens, the most studied work of architecture. The Doric order later spread across Greece and into Sicily, where it was the chief order for monumental architecture for 800 years. The Corinthian order is the most ornate of the Greek orders, characterised by a slender fluted column having an ornate capital decorated with two rows of acanthus leaves and four scrolls. It is commonly regarded as the most elegant of the three orders. The shaft of the Corinthian order has 24 flutes. The Roman writer Vitruvius credited the invention of the Corinthian order to Callimachus, a Greek sculptor of the 5th century BC. The oldest known building built according to this order is the Choragic Monument of Lysicrates in Athens, built in 335-334 BC. The Romans adapted all the Greek orders and also developed two orders of their own, basically modification of Greek orders. The Tuscan order has a very plain design, with a plain shaft, and a simple capital, base, and frieze. It is a simplified adaptation of the Doric order by the Romans. The Composite order is a mixed order, combining the volutes of the Ionic with the leaves of the Corinthian order. However, until the Renaissance it was not ranked as a separate order but was considered a late Roman form of the Corinthian order. Many of the door cases on the Victorian houses in this part of Dublin are decorated with consoles or ornamental brackets, with compound curved outlines, and usually worked in the stucco that my grandfather and great-father were familiar with. But the houses on Grantham Street, with their classical-style stucco and mortar pillars are worth the same attention we give to the Georgian houses and grand public buildings of Dublin. I have been invited to the celebrations in the Orlagh Restreat Centre this evebing marking Saint Augustine’s Day [28 August]. Sadly, this may the final celebration of Saint Augustine’s Day in Orlagh, which is due to close in the coming months. Saint Augustine is one of the few saints named in the 39 Articles (see Article 29), and he strongly influenced the writing of the collects and the Book of Common Prayer. The lecture is followed by Mass at 6.15 p.m., when Archbishop Jackson is also the preacher, and there is a buffet meal at 7.30 p.m. Many years ago, I had one of my pre-ordination retreats at Orlagh. The Augustinian community there, the Orlagh Team and the house staff have created a welcoming atmosphere and a warm welcome in a beautiful setting in pasture and woodland, with panoramic views over Dublin City and Bay out to Howth Head. It is a combination that has created an atmosphere that encourages and instills contemplation and reflection. The team was asked not to take any booking after next month [September 2015], not to prepare programmes for 2015-2016, and the property will be placed on the market next Spring . So long as Augustinians are living in the house, Sunday and weekday masses and the weekly meditations will continue, but this evening’s celebrations seem to be the last ones there marking Saint Augustine’s Day.